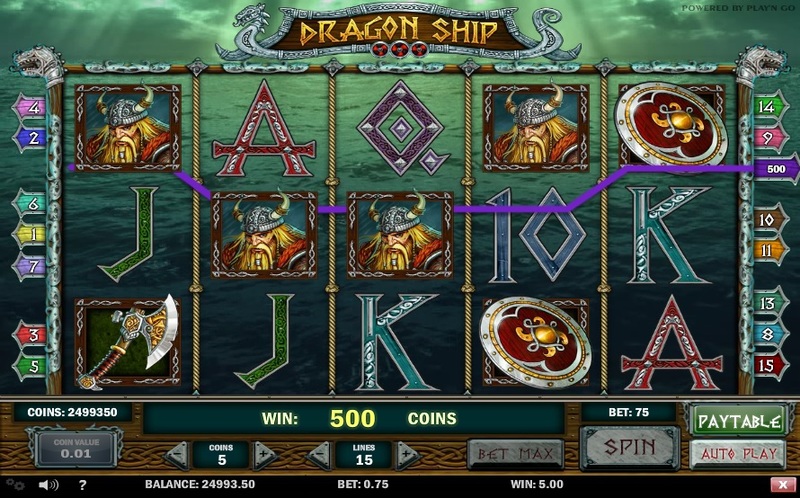 Dragon Ship is a delightful PlayNGo slot based on the Viking theme. Features such as multipliers, stacked wilds, free spins, and a bonus game opening on the second screen make the slot worth playing. Dragon Ship slot is played the same way all other PlayNGo slots are played. Players have to first select the number of paylines they would like to play, choose the number of coins they would like to bet per payline, and a coin value. Dragon Ship allows players to bet up to five coins per active payline and choose from a coin value range of $0.01 to $0.25. Players can therefore bet as much as $18.75 per spin of the reels to get the most out of this slot. There is also an Autoplay feature, which players can use to spin the reels automatically. Dragon Ship is based on the Viking theme. The reels are made of knotted ropes and set against the backdrop of a blue-green ocean, giving players the feeling that they are sailing on a Viking ship. Interestingly, Vikings ships were decorated with heads of dragons, which accounts for the title of this slot. The slot’s transparent reels feature Viking-related symbols and high-value cards, and players can hear the sound of the rough seas as they play. Dragon’s Ship comes with several bonus features in the form of stacked wilds, scatters, and a bonus game. The Dragon symbol serves as the wild, substitutes for all other symbols, and helps players win payouts. The Dragon wild can appear in the form of stacks of two. If players land a stacked wild on the first and fifth reels, the free spins round gets activated and players will receive 15 free games. To make things more lucrative than ever, the stacked wild symbol remains frozen in position for as long as the free spins round lasts. However, players cannot re-trigger more free spins while playing a free game. If players land a Treasure Chest symbol anywhere on the reels, the bonus game gets activated. This game opens on a separate screen, challenging players to select one of three treasure chests on display to win a bonus prize of up to 150 times their bet amounts. The slot has a top fixed jackpot of 2,500 coins, and in order to win it, players need to land a combination of five Viking Warrior symbols along any active payline. Dragon Ship is not only a beautiful slot, but also gives players plenty of opportunities to win prizes thanks to its stacked wilds, free spins, and bonus game. There is also an optional gamble feature, which players can use to double or quadruple their winnings. Dragon Ship is available for fun or real money at any online casino that offers PlayNGo games.